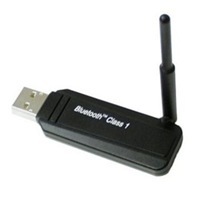 GUBCR41(A/B/R) is a Bluetooth USB adapter with Class 1 output power for Windows based PCs. This device can communicate with other Bluetooth devices to form a “Pico-net”. Thanks to Bluetooth technology, users can use this device to do variable applications with other Bluetooth devices, such us Bluetooth mobile phone, headset, Access Point, keyboard, mouse…and so on. Users will find out more pleasure from using Bluetooth technology and feel more freedom and mobility to access other application devices, not limited by cables any more.